The senate is winding down and will hear mostly house bills this coming week. The major tax relief bill passed the Senate committee and is one of the major pieces of legislation and will likely pass the full Senate. We will be sending a change in the Non-Compete laws so it is business and employee friendly. I am working on a pharmacy benefit manager’s bill to help lower the costs of pharmaceutical prescriptions. We also passed out of the Senate a bill requiring the credit reporting companies not to charge for freezing credit reports as well as unfreezing these same reports. This summer there was a major data leak and as a result anyone that has a credit card or charge account may be at risk of identification loss or theft. There are many other issues that we address that the press doesn’t cover so I would encourage everyone to look at the Idaho Legislative web page. Most of the bills reported on will not pass but makes great headlines. Gov. 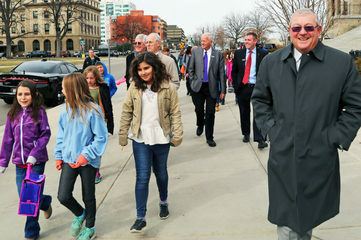 Butch Otter, 12 lawmakers and 45 fourth-graders from Boise’s Monroe Elementary School braced 30 degree weather Wednesday afternoon to walk around the Statehouse to raise awareness about health and fitness. They are participating in the Steps for Schools Walking Challenge, an annual event that encourages legislators to get out and walk each day. Click Here for the full story. This week I met with Magic Valley School Superintendents and school board members. We discussed issues of concern and interest that are happening in the Education Committees. Idaho Commission on Hispanic Affairs Legislative Reception. I serve as one of the Commissioners on the Hispanic Affairs Commission. 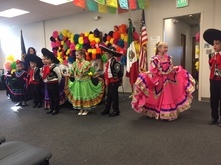 On Tuesday evening I attended the Idaho Commission on Hispanic Affairs legislative reception where we heard from a panel made up of State Education Superintendent Sheri Ybarra, Idaho Dept. of Labor Director Melinda Smyser, Idaho Department of Health & Welfare Deputy Director Lisa Hettinger and Mr Ricardo Pineda, from the Mexican Consulate, Boise. The discussion centered around the positive impact of the Hispanic population in Idaho. I continue in the “Steps for Schools” contest and on Wednesday we walked around the Capitol with 4th graders from a local school in Boise. Any legislator who averages 10,000 steps per day in the month of February will receive $500 for exercise equipment for an elementary school in their district. If I continue to qualify, Representative Bell and I will have a drawing to select a school in District 25 to receive the money. This week I presented HB 513 to the Senate Local Government & Tax Committee to exempt free medical clinics from sales tax. The committee voted to send the bill to the Senate floor with a “do pass” recommendation. The bill already passed the house and will now go to the Senate floor for debate. The House passed HB533 to increase the amount the State pays counties who house state sentenced inmates changing the amount from $45 per day to $55 per day for the first seven days and $75 a day thereafter. This has been an issue of discussion recently with county officials who are being paid less than their costs to house state inmates. This is a much needed and desired change. I presented HB 537, the Food Safety Modernization Act (FSMA) in the House Agriculture Committee on Tuesday and it passed unanimously. It is now up for vote on the House Floor and if it passes will be sent to the Senate. Representative Kauffman receiving Wayne Meyer Statesman Award. 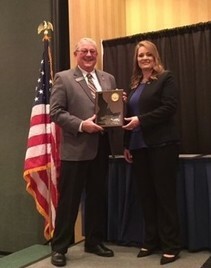 On Friday afternoon I attended the Leadership Idaho Agriculture (LIA) graduation where 29 individuals from all areas of Idaho graduated in Class 38. At that ceremony I was honored to receive the Wayne Meyer Statesman Award. Wayne Meyer was a lifetime member of LIA, graduating in Class 27. Wayne was a farmer on the Rathdrum Prairie in North Idaho and a leader in the grass seed industry. He was active in his local community and served as a State Legislator from 1995-2004. The LIA Foundation established the LIA Statesman Award in honor of Wayne and to continue to recognize dedicated public service by LIA alumni. I graduated from LIA in class 13 in 1998. Contact me with concerns or questions. It is an honor to serve as your Representative. Senator Jim Risch and Senator Mike Crapo came to the Idaho Capitol this week and gave a congressional report to both chambers of the Idaho legislature. Idaho Sen. Jim Risch, who startled security experts at an international security conference in Munich, Germany over the weekend with threats of a clash of “Biblical proportions” between the United States and North Korea, said today that he meant every word of it – but only if North Korea uses nuclear weapons first. Click Here for the full story. What a great way to start the last full week of February. It is always such a privilege to have friends and neighbors from our district. We began the President’s Day with an early morning breakfast with some of our 4-H members. 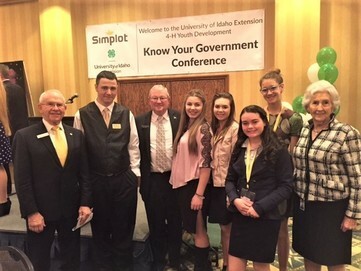 There is a full week-end of hands-on events to help them know about government. The highlight for me was the speaker. Allyssa Hansten from Jerome. She did a great job, and it is a pleasure to have her share her abilities with the legislature. The following day, we met with some of the school superintendents from the Magic Valley. Staci Leavitt and Don Mitchell from the Jerome School Board were welcome guests. The largest budget we set came together this week. We have learned a lot over the years. I was reminded of Thanksgiving Dinner. It appears on the table and is a memory in a very short time, however, the preparation can be hours of intensive labor. The budgets are all worked on during the days prior to the actual funding. Small groups of those interested meet and study what is necessary and reasonable. This activity makes the actual vote to spend more comfortable for those of us responsible to manage your tax dollars. The budget for K-12 included an additional one hundred million with 32 million more in a saving account for the addition of students as they come into the school during the year. This is the third year we have had the funds to include an extra $100 million. The number of bills on the floor continues to build. As with a number of them, many are minor adjustments. It makes one wonder why we did not do a better job on the original attempt. One bill pointed out that while we should always pull over and stop for emergency or police vehicles there is not a parking lot on the side of highways. Easy clean-up. Another bill was presented to prevent foreign law from being used in Idaho Courts. Idaho Judges take the same oath of office that I do, to uphold the laws of the United Stated and the State of Idaho. Most of us have known Jim Jones and Roger Burdick when they lived and worked in the Jerome area. We also knew them both as Supreme Court Judges, where Judge Burdick is now the Senior Judge. This bill implied a violation of that sacred oath by our judges. I was sorry to see it move to the Senate. We will have the budget bills on the floor by this time next week, which usually signals the beginning of the end of another session. 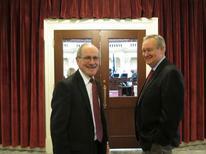 Our final visitors of the week were our two senators, Senator Risch and Crapo. One of our own, Robert Sonnichson, who grew up and went to school in Jerome, is a member of Senator Crapo’s staff. 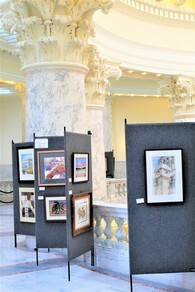 The 34th Annual Idaho Watercolor Society (IWS) Capitol Rotunda Show began this week and will run through March 4, 2018. The IWS is a state-wide society which promotes and supports the use of watercolor media. Ruth Clark was the founding member of the society and to this day, IWS supports student artists by awarding three yearly Ruth Clark scholarships. Click Here to learn more about IWS.